Last April, the Mirror revealed that 32 people die every week in the UK after being found “fit for work” by the Department for Work and Pensions (DWP). The Work Capability Assessment, undertaken by ATOS, has been shown again and again to be unfair and damaging. And things are only getting worse. 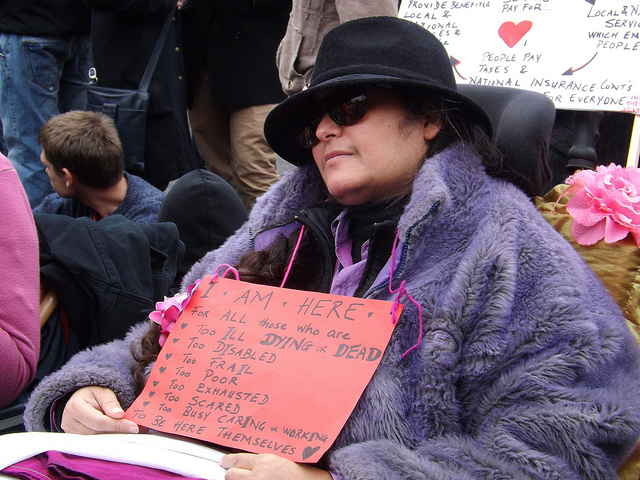 Whereas non-disabled people on benefits could be forced to do unpaid work for up to four weeks, disabled people can be called upon to do it indefinitely, risking losing their income if they are unable to keep up or are faced with a workplace which does not offer reasonable accommodations, if the Job Centre does not recognise these as valid reasons not to attend. The latest changes which have been announced by the DWP are taking what was already ridiculous to an obscene level. The system that found a man in a coma fit for work, and seemingly contributed to many suicides is now going to use imaginary objects and limbs to make their decisions. If your assessor judges that you could benefit from using a power chair (~£2,500), then they will judge your ability to carry out tasks as if you had one. If they think that if you had a prosthetic limb (~£3,000 – £30,000) you could work at a supermarket, they will assess your ability to work as if you had one. If they think that a specialist computer keyboard (~£150) would help you to work, then they will consider you able to work, whether or not you, or a potential employer, could buy or use one. There is no regard for whether or not a person can afford this imaginary object, or if that imaginary object is suited to them, or if the imaginary object is expensive to maintain. It does not matter. In some weird, ideal world full of appropriate disability equipment, every one of those scroungers on benefits could get a job. So let’s send them to inappropriate work placements, take their money away if they are too ill to make it, and pretend that they’re better and not battling an impossible system which is carefully designed to catch them out at every stage. Being disabled is really expensive. I had to buy an elaborate vegetable chopping machine for £30 where previously I would have just bought a knife from the pound shop. I had to pay £80 – yes, £80 – for a special one-handed chopping board, and the idea that equipment and help is funded and provided by the NHS or social services is pretty inaccurate for most people. This is a social justice issue. It is a matter for everybody who cares about fairness and equality, and things have to change. Two of my close friends, and others, have talked today on Twitter about considering, or planning, options for suicide. This is not due to their impairment, but due to the way they are treated by government agencies and the health service. So what can you do? The clearest analysis of these changes that I have read is from Ekklesia. Briefing on ESA Regulations [Ekklesia] I recommend that you read this. Please write to your MP urgently to oppose these new regulations. You can find and contact your email through Write to Them. My own communication with my MP will be available on this blog later today. Please share this and other blogs about this subject on Twitter with the hashtag #esaSOS as well as on Facebook and anywhere else you think suitable. A tweet of your own will have far more impact than a retweet. Please also add your signature to the War On Welfare petition to call for a cumulative impact assessment of this government’s welfare reforms. Thanks Laura. It really is appalling, and the more people who take action, the better. as laura says, this is just awful. how can they do this? how can they pass these thoughtless and cruel laws? solidarity and i too will be writing.